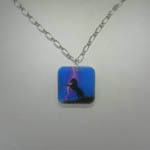 Desc: Acrylic rearing black horse in storm necklace. The chain is an oval link alternating with a small circular link and has a lobster claw clasp. The acrylic square has a black horse rearing in a thunderstorm with a bolt of lightening behind. 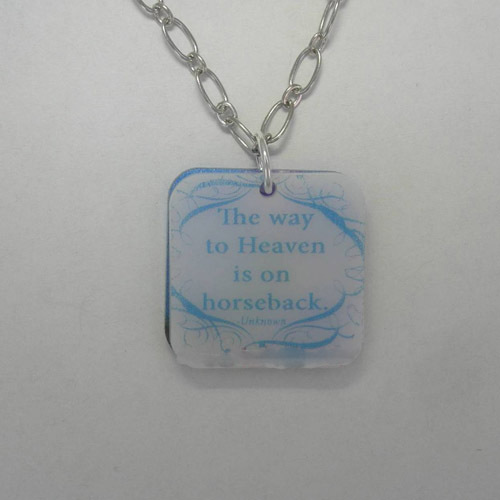 The back acrylic square has a saying, "The way to Heaven is on horseback." This can be personalized with a photograph you supply and a personalized saying of your choice or other sayings we have on file. Contact us for details.